Passion One Bold font family series mainly provide  and other font styles. Passion One font family series mainly provide Regular,Bold,Black and other font styles. Passion One Black font family series mainly provide  and other font styles. PassionSansPDak font family series mainly provide Bold and other font styles. PassionSansPDao font family series mainly provide ExtraBold and other font styles. PassionSansPDal font family series mainly provide BoldItalic and other font styles. 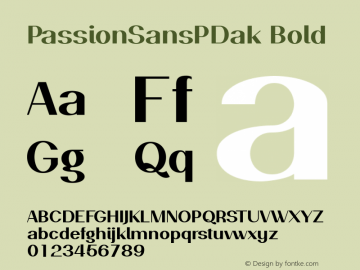 PassionSansPDai font family series mainly provide SemiBold and other font styles. PassionSansPDbk font family series mainly provide BoldSmallCaps and other font styles. PassionSansPDap font family series mainly provide ExtraBoldItalic and other font styles. PassionSansPDaj font family series mainly provide SemiBoldItalic and other font styles.